If you want to impress someone with dessert, but have no clue where to start, let me suggest you try to poach a pear. And now you're skeptical, but a poached pear is essentially just a peeled pear simmered in water, wine and/or syrup. You don't even have to keep your eye on it! I've been waiting to get my hands on some Dona Chai so I could make these chai poached pears. Dona chai is a chai tea concentrate company based in Brooklyn, NY. I love concentrates because you don't have to steep anything. The concentrate is in a liquid form, ready for everything from sweet recipes to warm drinks. 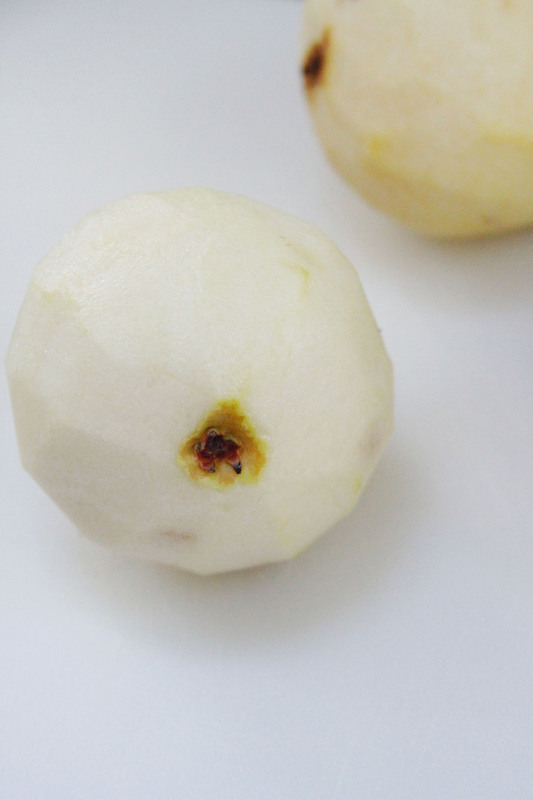 Dona Chai shines in the poaching liquid for these pears. add a cinnamon stick if you have it, otherwise enjoy these drizzled with tons of caramel or keep it simple with vanilla ice cream. Start by peeling your pears. You'll want to keep them whole, but just remove the skin. Bring the water, sugar, chai tea concentrate, cinnamon stick (if using) and lemon juice to a boil in a large pot. Gently place the pears in the boiling pot. Lower the heat so the liquid only simmers versus a high boil. Allow the pears to poach for ~30 minutes, until soft. Remove the pears from the poaching liquid + serve warm with a drizzle of caramel, if desired.